Our southwest Colorado travels included a Mesa Verde RV stop. The cliff dwellings were a sight we didn’t want to miss. We weren’t disappointed. It was fascinating to visit the cliff dwellings and learn about the people who constructed them and lived in these community pueblos, literally “on the edge”. We took a couple worthwhile ranger-led tours, as well as visiting just about all the major sites in Mesa Verde National Park. We stayed at the Mesa Verde RV Resort, one of our Happy Camper Parks. It is only a half mile from the entrance to Mesa Verde National Park. It is also a good base for exploring the nearby towns of Durango and Cortez, the Anasazi Heritage Center, the Durango-Silverton Railroad and more sites in the Four Corners area. There is a pool and two spas, and we really appreciated the free WiFi from our site. See our thoughts on Mesa Verde RV Resort, the National Park, and nearby places to visit. Well, our foray into New Mexico was not as we had planned. After leaving Mesa Verde, we headed to Canyon de Chelly, with plans to spend a few days. Upon arriving, Jose pulled into a parking lot just outside the campground to unhitch the tow car so we could look for a big enough campsite. Well, when we returned to start up the motorhome, the power steering was gone. Jose did some diagnostics and called the manufacturer to see if there was anything we could do to fix the problem ourselves. The bottom line was there was nothing we could do and we needed to be towed to a repair shop. After a few back and forth phone calls, a tow was arranged. As you might imagine, you can’t just send any old tow truck for a 40-foot diesel pusher. This big tractor-trailer showed up with a very long tilting flat bed. Jose had to drive the rig up while the tow truck driver lined things up and tilted the bed at different angles to accommodate the motorhome. Getting your motor home towed is something that no RVer wants to see happen…but if it had to be, we were glad it was a flat bed trailer. Anyway, we followed the tow truck all the way to Gallup, New Mexico. And we can tell you that it is no fun watching your home being carted down the highway in front of you. We spent several nights in the repair shop parking lot. The mechanics had to figure out if the problem really was the pump and not something else, then find a place to get a replacement pump and then get the part ordered. In between were some discussions with our extended warranty company. Long story short, it took longer than we wanted, but not longer than we should expect. After all, wasn’t it just last September that we were in RV service? Yikes, let’s hope this isn’t going to be an annual tradition. While we got off to a shaky start in New Mexico, we could have done worse in terms of a detour. After all, Gallup, NM is right on historic Route 66. So we toured some of the sights in and around Gallup and then traveled on Route 66 toward Albuquerque. It is sad to see how few of the nostalgic Route 66 landmarks remain. Yet there are still some vintage hotels, motel courts, restaurants and other buildings scattered along the remaining stretches of the legendary byway. We picked up a Route 66 brochure that highlighted some of the remaining landmarks. Then we turned up the volume on our imagination, as well as Nat King Cole’s rendition of the “Get your Kicks on Route 66” song, and motored along. We made a stop at Acoma Pueblo, which we recommend for a good Native American Pueblo experience. This was a guided walking tour and our guide was both interesting and entertaining. And of course we found plenty to do in Albuquerque. We spent a week at Hidden Valley RV Park, under our Resorts of Distinction membership. We had a chance to dance, hike, bike and sightsee. We will be returning to ABQ for the Balloon Fiesta in a few days. We left Tijeras and headed north on the Turquoise Trail up to the Santa Fe area, a beautiful drive in itself. We expected that we would spend a day or so browsing around Santa Fe, but were surprised how much we enjoyed the many galleries. As fulltimers who have disposed of most of our household possessions, we certainly aren’t in the market for fine art and life-size brass sculpture. But we really enjoyed the experience of just looking. Santa Fe is a major art market, so there are many top quality pieces in the numerous galleries. And the setting of adobe and gardens and perfect weather added to the pleasant ambiance. In addition to taking in the art and historic downtown Santa Fe, we visited Bandelier National Monument, Los Alamos, Taos, a casino and a foundry. We were staying in a Happy Camper Park in San Juan Pueblo, which turned out to be a good central location for visiting Santa Fe, Taos and other nearby sights. And we had a chance to wash and wax the coach, a job we like less each time we do it, but that we accept as a necessary evil in our RV lifestyle. If you happen to be traveling in your RV at Halloween, here are some ideas for an RV Halloween. Halloween and winterizing and watching fall foliage. Guess what that means? The holidays are right around the corner. Time to start coming up with some gift ideas. Throughout all of our adventures and misadventures, Hiker Happy has been a great companion. He doesn’t complain, makes few demands and is always smiling! It makes our hikes and pictures a lot more fun. And of course, he has been keeping up with his blogs both on our site and over at RV scrapbook. Check out his latest! 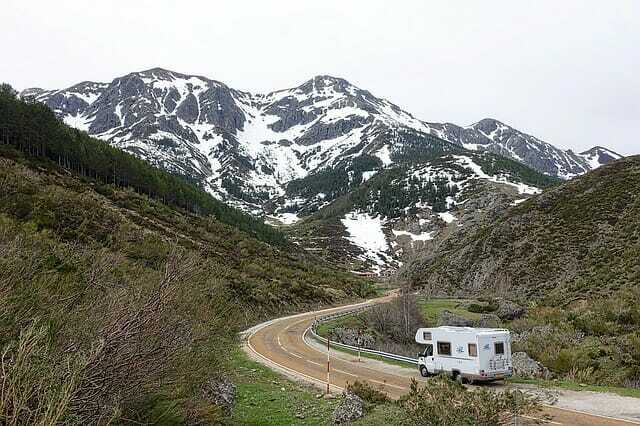 Keep track of your RV travels. The RVer’s Notebook helps you manage costs, keep track of where you have been and what you enjoy. Check out this handy software package to help manage all sorts of RVing things. Check out Your RV Lifestyle Store. Featured books and items to make your RV lifestyle more enjoyable. Learn, plan, play. A variety of products to suit your needs or give as gifts.